The Hong Kong Tourism Board will stage the second Hong Kong Wine and Dine Festival for four consecutive days at the New Central Harbourfront. 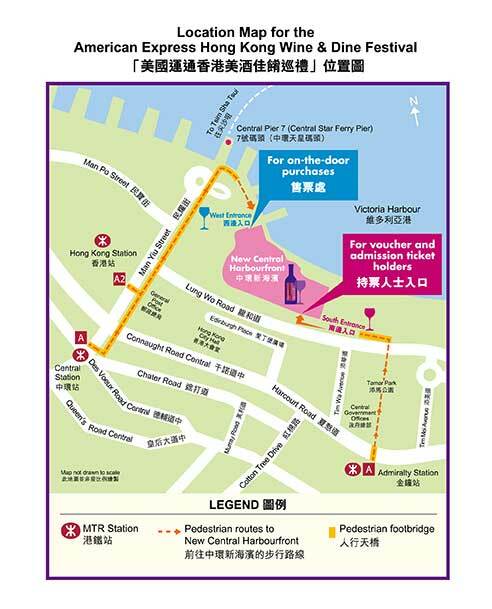 It’s the perfect spot to sample great wines, tuck into some fantastic food, listen to superb live music and soak up the surrounding fabulous views of Victoria Harbour. 長者及兒童現場入場費 Concessions Admission on the door: 65歲或以上長者、3至11歲兒童港幣$15；3歲以下兒童免費入場。 $15 for Aged 65+ and children aged 3 to 11; under 3s are free. Includes five Grand Wine Tokens for wine tasting in the Riedel Grand Tasting Pavilion and a few coupons offered by the sponsors. A Riedel wine glass with pouch will be provided. Additional Grand Wine Token are being sold at HK$50 each. Each tasting requires maximum 3 Tokens. Includes of 8 Classic Wine Tokens for wine tasting at any wine booths at the venue (except Riedel Grand Tasting Pavilion) and a few coupons offered by the sponsors. A LUCARIS wine glass with pouch will be provided. Additional Classic Wine Token are being sold at HK$15 each. Each tasting requires maximum 3 Tokens. Includes of 12 Classic Wine Tokens for wine tasting at any wine booths at the venue (except Riedel Grand Tasting Pavilion) and a few coupons offered by the sponsors. Two set of LUCARIS wine glass with pouch will be provided. Additional Classic Wine Token are being sold at HK$15 each. Each tasting requires maximum 3 Tokens. WINELIST.HK is a Wine Media, Education & Consultancy Company in Hong Kong. We aim to share about the joy of wine with the public in an interactive way while providing innovative solutions for corporate clients.